Keep it simple, make it quick. 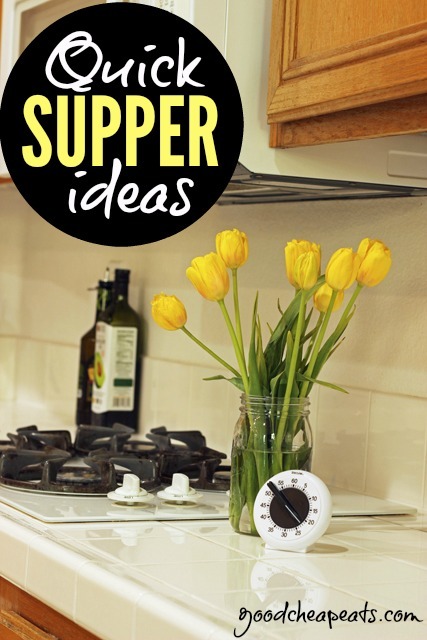 Try one of these quick supper ideas on a night when you need a quick fix dinner and don’t want to spend a lot of money. Dinner time can be crazy, can’t it? You want to feed your family well, but oh the time! Good Cheap Eaters recently reported that they’re spending 15 to 90 minutes making dinner every night. 90 MINUTES! Ouch! if you’re on the long end of dinner prep! Over the last couple years I’ve been collecting an arsenal of recipes that are quick to fix and welcomed by my whole family. Man, on those nights when I just can’t justify take-out, these meals come to my rescue and make me feel like a superhero. I’m sharing some of these Quick Fix babies today. These recipes are those that I’ve designed to be easy, flavorful, and fast. You can pull together these meals in less than 30 minutes! How’s that for Wonder Woman status? If you love the Quick Fix as much as I do, be sure to grab your copy of the Month of 30-Minute Meals menu plan. 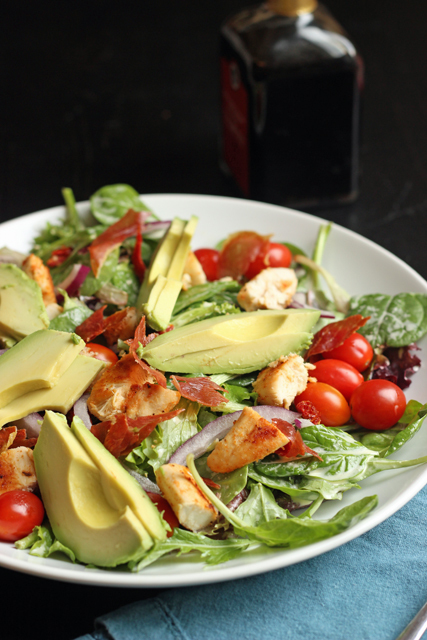 This Chicken and Prosciutto Salad is hearty without being heavy. Tender chicken, crispy prosciutto, and garlic aioli dress a simple yet tasty salad. If you’ve got picky kids, you can offer the ingredients separately on the plate, add a few crackers, and call it a “snacky dinner”. Take beans and rice to a whole new level with this savory chicken topping touched with the awesome sauce that is sour cream and salsa verde. 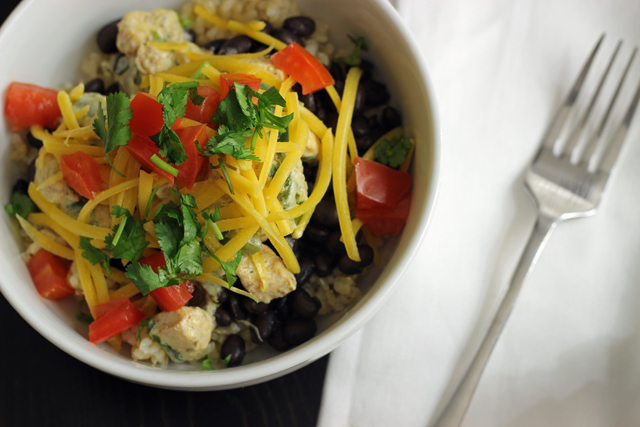 Let your peeps assemble their own Chicken Cilantro Bowls so they get just the right amount of toppings that they want. Taco Night is the highlight of the week. Kids love ’em, and Mom loves how quick they are to make. Make this week’s taco feast good and cheap with this spicy turkey and bean filling. This French version of a Hobo Dinner is sure to please. 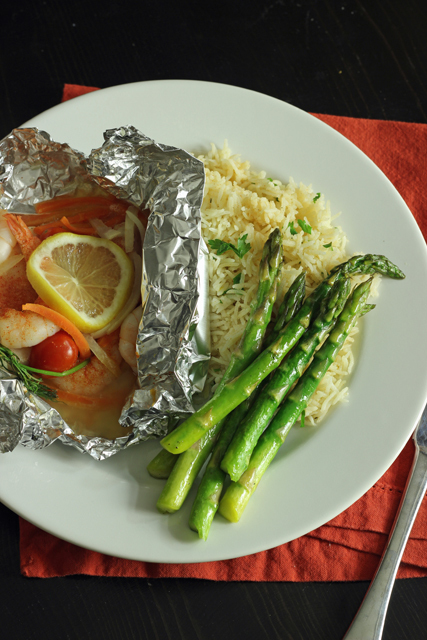 For these Fish and Shrimp Packets, wrap chunks of fish and whole shrimp in foil with vegetables, herbs, and butter for a simple and succulent supper. Serve it with Baked Rice that you can cook at the same time. 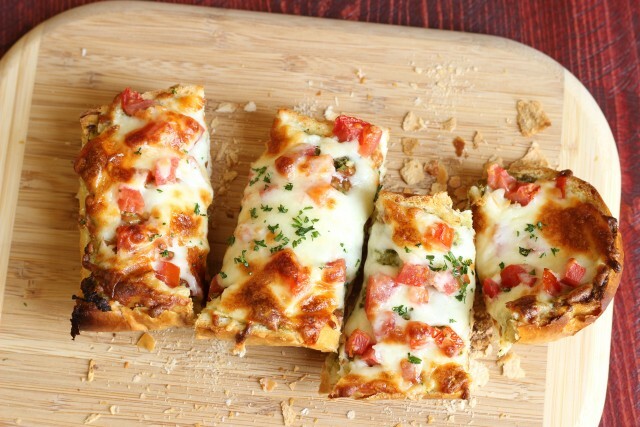 Make delicious homemade pizza in minutes by using French bread as the base. Of course, feel free to vary your toppings but this Pesto and Tomato French Bread Pizza is great. Have you got a favorite quick-fix recipe? Let me know what your family loves to eat that’s quick to make! This post was originally posted on April 27, 2015. Mix tomatoes, garlic, basil, salt and pepper and olive oil in a large bowl. Cover and let sit for 3 hours at room temperature. Cook pasta. When done, drain and return to warm pot. Remove all garlic from marinade and discard. Pour the rest of the tomato marinade over pasta and mix well. Spoon onto plates and top with shaved provolone. This sounds so good! I don’t know provolone well. Never knew there was a sharp! Now I’m eager to try it. You can find this wedge of sharp provolone in the specialty cheese section of your store. I never knew about it either until a friend gave me this recipe. Unfortunately, the wedge is bigger than you’ll need for this dish but it lasts a while if you want to make it again in a couple of weeks or you can slice it and put in on some thin slices of French or Italian bread and top with a small slice of tomato and some basil or without all of that. 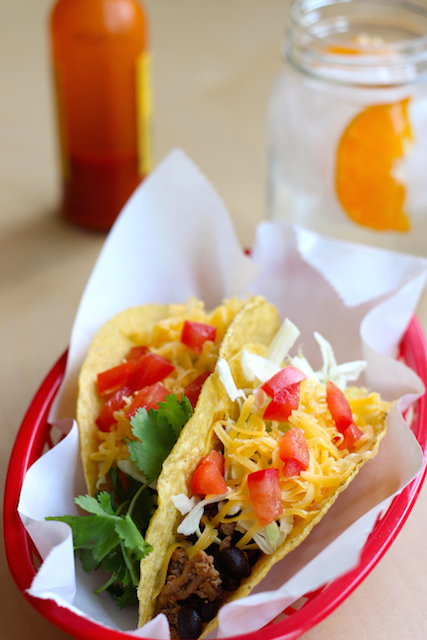 We love the turkey black bean tacos. I have changed up the beans with what I have on hand and have used some different Herdez cooking sauces that I got with coupons, to give it a different twist. When I ask my kids what they want for dinner, they always ask for my Teriyaki Chicken Sandwiches. I buy the thin-sliced chicken breasts and cook them quickly on the stovetop in my Rachel Ray Grill Pan, (which I LOVE and use a lot), basting with Kikkoman teriyaki basting glaze. Then serve on a toasted ciabatta roll (or something equally tough and hearty…soft rolls tear apart) with mayo (sounds odd but this is an important part of the flavor) and a pineapple ring. This meal is ready in like 10 minutes. Serve with fruit, veggies, salad, chips, etc. Or just by itself. Great meal for camping, too. The mayo does sound odd. How interesting! Thanks for the tip! My family loves all things Mexican! Quesadillas and nachos are 2 favorite quick fix dinners and I am very grateful that everyone likes a big salad. What can’t you put in a quesadilla? Any combo of leftover veggies and meat. Our favorite is bbq sauce, chicken, red onion and cilantro. Make your own salad is also popular….just put out every bit of leftovers and veggies and let the kids make their own combo. My 7 year old made a cold pasta, spinach, steak, pretzel chip, and stinky cheese salad….and he ate every bit with a smile! Quesadillas are my family’s quick fix. I always have some kind of meat to throw in them (pulled pork, taco meat, grilled chicken — whatever). A little cheese, some veg and they are perfection. Like Karen, above, we’ve been having BBQ, red onion, cilantro and whatever meat there is. We also can do fast paninis with similar filling. I’ve been going to extra effort this summer to make sure there is always some kind of grilled meat and salad fixing available — thrown together you have dinner. Egg salad is also a fast one for my family and great picnic food. We like to eat it on crackers. Our family likes a “noodle bar” – I put out a bowl of noodles with frozen peas tossed in (they defrost quickly if you combine them with the just-cooked noodles and cover bowl with a plate). Then we put out separate containers of chopped meat/protein (chicken, turkey, ham, eggs, tuna, beans- whatever is around and needs to be used up, often straight from the fridge or microwaved briefly), and small bowls of cheese (either shredded or cubed – whatever kind and flavor is on hand). Endless variations possible, so kids never get bored. My personal fave combo is noodles, peas, leftover bacon, and swiss cheese cubes. We did a pasta salad bar last night, similar to this. Everyone really loved it.